Twirling under the tulip tree. and another mockingbird sang the sun down. following the sun like a cat. today makes it all okay. another 10 degrees would be perfection. not even those of spring. A perfect day! What a great shot that is! Envious that nothing is in bloom yet here. i love this photograph and your gorgeous energy in this post! Spring, alas! 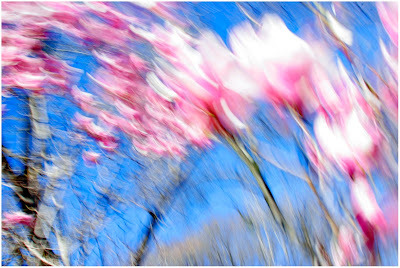 beautiful spring blur, sounds like a heavenly day. i'm craving the sunshine too - soaking it in every chance i get. rain today will do the buds and blossoms good. this photo actually makes me dizzy...but that is what i love about it! you perfectly captured the spin. Paula - I will blow some blossoms off to the west for you. Graciel - It was quite pleasant. Your presence would've made it even more so - another leg for Lily to rub against. Beth - Another today, with humidity and the storms not yet here. syw - Me too. Remember that Beatles song, "I'll Follow the Sun"? Been humming it for a couple of days now. mrs m - It made me dizzy when I took it. But it's springtime and that in itself is dizzying and wonderful! Thank you! What a fabulous, fabulous spring photo. Thanks for bringing spring closer to me. not even those of spring." Oh, but today, this very day...in a couple of hours, pacific time, it will be official. if i were . . .
Home. Place. Further. Place. Home. Self Pity + Art = Me, Today. Life Imitates Life: Broken is as Broken Does.